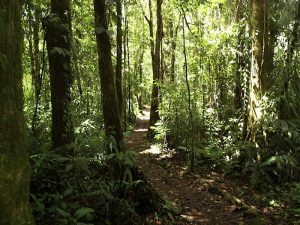 Walking is actually the best way to discover the beauty of Costa Rica. While walking through nature you will discover things you would never have discovered while flying, driving or even running. We guess you came to Costa Rica for nature in the first place. So, walk in peace and open your senses and you will be amazed. And besides that, it is very healthy, it clears the mind and cleans up the body toxins. We offer some nice trails. As you walk through the trails of this primary forest you will have the opportunity to appreciate the countless variety of plants and trees. Take your time to spot tropical birds, butterflies and other wildlife. Experience the true beauty of the rain forest environment. 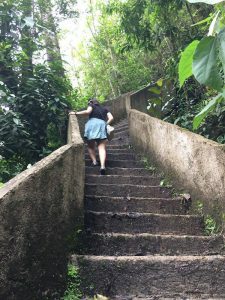 The first trail is a self-guided tour all the way to the bottom of the most impressive waterfall of Costa Rica. Which is second to none in beauty and splendor. It throws itself 90 meters into an old extinct volcanic crater. First 500 meter of the trail is flat and has several fantastic lookouts. And second part is also 500 meters with steps with high impact. People with heart conditions or any other medical condition, older people and pregnant women should not go down. For the rest of the people they need to take their time coming back up. The 350+ steps are safe and partly made of concrete and it has several sitting areas and nice views. Duration: 90 minutes including the forest and garden trail. While hiking down do not forget to look up once in a while. So, you can enjoy the rock formations of this ancient volcanic crater and all its colors. Probably you will also notice the special chemical composition of the water.